Justen Dela Cruz is currently a senior at the University of Hawaii at M?noa, majoring in Mechanical Engineering. 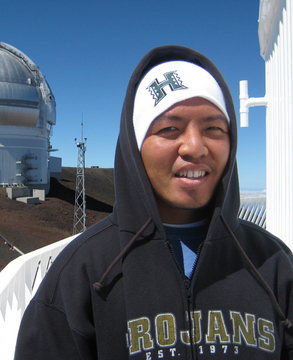 He is a graduate of Mililani High School, and was born and raised on the island of O‘ahu. He is thrilled about his opportunity to intern on the Big Island. In his free time, Justen enjoys music, going to the gym, playing sports, and hanging out with family and friends. Having a uniformly coated mirror with a sufficient thickness (900 to 1000 Å) of a reflective metal is important to guarantee its longevity and to provide the best possible image quality for the telescope. The mirrors of the Canada-France-Hawaii Telescope (CFHT) are coated inside a high vacuum chamber where several hot tungsten filaments vaporize aluminum, which then deposits on the glass. Inconsistent wicking of aluminum onto the tungsten filaments has been a constant problem with the CFHT aluminizing chambers. Since preparation time for the large chamber takes longer than for the small chamber, testing was done with the small coating chamber to investigate the problem. Initial tests compared two different ways to hang aluminum clips on the tungsten filament. Each filament consist of five helical loops in the center and one semi-circular dip on either side of the central loops. Our tests showed that hanging the aluminum clips in a “splay” (widely separated) configuration produced a thicker coat than with the clips in the close-together configuration. In addition, during these initial tests, we found that degassing the filament was a necessary step in the coating process. Secondary tests were done (using the splay configuration of the aluminum clips) with different tungsten filament designs: a filament with dips closer to the helical loops, and a filament with no dips. After numerous tests and a modified coating procedure, the no-dip filaments proved to give a thicker coat than tests done with the closer-dip filaments. From the data received, it shows that it is possible to get a coat of at least 100 Å thicker with the no-dip filaments than with the closer-dip filaments. The results also show that this new clip and filament geometry give a more consistent coating. With testing still ongoing, hopefully soon the splay configuration with the no-dip filaments will be tried with the large coating chamber.